FREELY SIGNUP & Start Losing Your Unwanted Fat With This 100% Research Backed Program! Gym? Nah, not required. Fad diet? Nope. Pills? NEVER. Program is backed by 450+ international research studies. One-of-a-kind, long-term, behaviour based fat loss program. Has worked for 100's of women in the last 15+ years. What Exactly Is This "Lean Queen" Program? Lean Queen is a time-tested, behaviour-based fat loss program, specifically created for Indian women. Here, at Scientific Nutrition, we’ve been helping our fellow Indian ladies lose fat and get fit for the last 15+ years (in Mumbai)… all thanks to the Lean Queen program. And now, with the Digital India boost, we are bringing it online to help YOU, as well as each and every Indian woman who needs it. 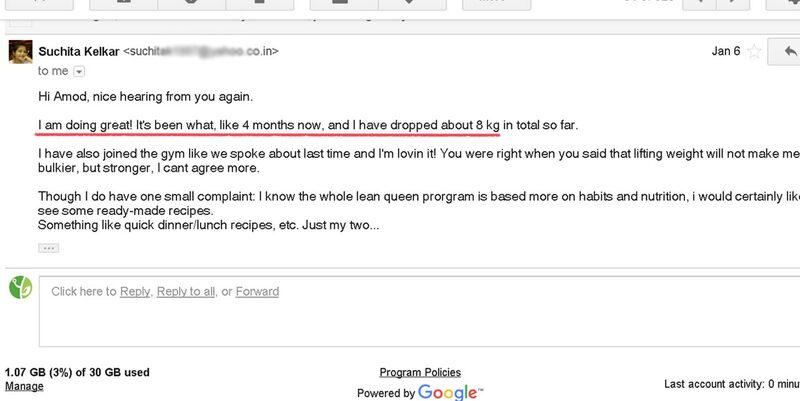 Ok, So What Will This Lean Queen Program Do For You? What’s It All About? They go to a dietitian and DEPEND on her elaborate “diet plan”. You somehow stick with this for a week or two, but then life gets in the way, and the diet plan gets chucked somewhere in the drawer. Some women join the local gym, and DEPEND on the trainer there, who usually commands you to start running endlessly on the treadmill, because hey... “Cardio is a must, right”? (Well, no. You DO NOT need to do ANY cardio to lose weight). And some women are so frustrated seeing no significant success with their weight, that they mistakenly DEPEND on dubious products like all those sauna belts, pills, fad diets, or even weight loss surgeries! We keep depending on someone else (dietitian, trainer, some gadget) for something as VITAL as our health and weight. Whereas we STRONGLY BELIEVE that something as important as your health and fitness should ALWAYS be in your hands (meaning the knowledge of it...). Depending on someone else to give you an instant "perfect diet" or workout is never going to help in the long run. Weight loss was NEVER about your diet or workout . Did you know that EVERY diet... works?! Atkins, Paleo, Keto, low-fat, GM, Fasting, Mediterranean, they ALL work ! Well then what’s the problem? Why aren’t YOU able to lose weight with them if they all work? It doesn't matter *WHICH* diet you follow … it's whether you're able to STICK with it THAT MATTERS. Unless you have a daily system , something that will help you stick and follow that plan, no diet, no workout will help. Coz if you can’t follow it, if you stop half-way, how will ANY diet help and give you results? The GM diet, or the Keto diet will work, but will you be able to do it for more than 6 months? So the ONLY way you will ever really lose fat and get back in your best shape is: When you’re able to follow a nutrition (and fitness) plan for weeks and months. If you CAN follow a nutrition and fitness plan, of course you would see results. YOU WILL FOLLOW AND MAINTAIN A PLAN ONLY IF IT’S EASY TO UNDERSTAND, AND SIMPLE TO FOLLOW, EVERY DAY. If you keep jumbling with all those numbers like BMI, lean body mass, etc. = You will FAIL... because they're too complicated in the long run. Counting calories at every meal? You will FAIL... because again, it's too complicated for long-term. Complicated recipes that are hard to follow? You will FAIL... again, not easy to keep up in the long run. Depending on a dietitian for YOUR food intake? You will FAIL... because you DEPEND on her/him, with no knowledge (power) or understanding of how weight loss works to you! If you keep jumbling with all those numbers like BMI, lean body mass, etc. You will FAIL... because they're too complicated in the long run. Counting calories at every meal? You will FAIL... because again, it's too complicated for long-term. Complicated recipes that are hard to follow? You will FAIL... again, not easy to keep up in the long run. Depending on a dietitian for YOUR food intake? You will FAIL... because you DEPEND on her/him, with no knowledge (power) or understanding of how exactly weight loss works to you! So, enough with the negativity, what then, will actually help you stick to a plan? YOUR ENTIRE WEIGHT LOSS SUCCESS HINGES ON… WHAT YOU ACTUALLY ‘DO’ EVERY DAY… aka… YOUR DAILY HABITS ! So let’s assume you get a simple, easy diet. You should start losing weight now, right? Unless you have a HABIT SYSTEM in place, that will help you adopt those vital habits required to stick to this plan, you won’t (or can't) continue with the plan. When in reality, what happened was we simply didn’t have a daily habit system in place to stick to the plan. Right Now, You Do Not Even Need A Diet Or A Workout Plan! Because chances are you already know some of the basics… what to eat, what not… the good/bad foods, etc…. … for one reason or the other, the most pressing issue is we are not able to *STICK* with a particular plan . Meaning – you don’t fail to lose weight (or keep it off) because you are eating the wrong foods, or you do the wrong exercises, or you don’t have some *secret* diet. We fail because we keep changing WHAT we do, without changing WHO we are. You know, things like - be more romantic, pay more attention to your partner’s needs, blah blah blah. But at the end of the day, if your bad temper is the reason for the problem, there is no secret tip or trick on the planet that can fix the relationship. You need to fix the root cause – the temper. Period. It’s not at all different for weight loss. We change the diet plan, the exercises, the books, the strategies like a 100 times without changing OURSELF even ONCE. ... LEAD TO THOSE amazing changes in your body! there’s no change in THEIR body! What you DO = your ACTIONS, every single day, consciously or unconsciously, creates the life (and body) you have today. Weight loss is not about your diet, it’s first and foremost about YOU, and your daily habits. Tiny, daily habits that build up over years and decades. What you see in the mirror is the direct result of months, years of conscious and unconscious habits. The way your body looks in the mirror right now, is NOT because of what you do ‘some time’ (like a diet you try for 2-4 weeks). What you see in the mirror is the result of what you’ve done every day for the last few years, or even decades. So the one single thing you should be focusing on before diets and workouts is forming HABITS that will give you long term results. But *HOW* do you do that exactly? Which exact habits do you form? And really, where should you even begin? 100% online - so you can access from anywhere! No calorie counting, no mind-numbing cardio! Adjusts to YOUR pace, so no frustrations! Best suited for long-term, permanent fat loss! Lean Queen is the first and ONLY behaviour-based fat loss program in India. For the last 15+ years, we’ve been helping our members lose weight and get back in awesome shape. With the help of our habit mastery module, ‘no calorie counting’ nutrition module, and with easy body-weight exercises (that anyone can do at home), we have helped hundreds of women get in their best shape! And now, thanks to Digital India, we’re bringing it to you! Now, usually the whole training package costs upwards of ₹7800 in-person. Since this is the FIRST time we’re launching it online, we are giving away 30 memberships for free so we can get your valuable feedback on it. 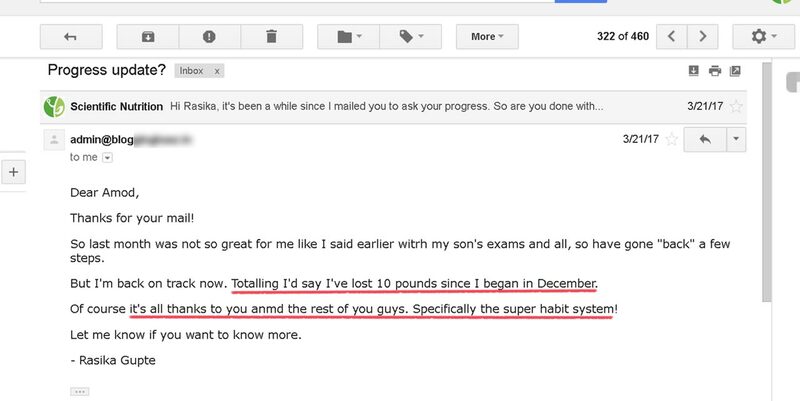 In short, you get India’s first and only research (and experience) backed, behaviour-based, fat loss program for free. So before the 30 seats run out… SIGN UP… NOW! "I like that it's all online... I LOVE the habit mastery module... I have lost 3kg in the last 3.5 weeks...!" "As for my progress, I am doing good. I have lost a good amount of weight... I am SUPER MOTIVATED..."
"It's been like, what, 4 months now, and i have dropped about 8kg in total so far..."
"I like the most - habit tracking plan, the ANP plan and the exercises... also like that everything's online...it's made it very easy"
"... weight loss has been 2.5kgs in the last month and half... I am definitely sticking with this plan..."
"I'd say I've lost 10 pounds since I began in December... all thanks to you and the rest of you guys..."
[x_icon type="map-marker" style="color:#9ec749;margin: 0 4px 0 5px;"] Scientific Nutrition, Fifth floor, Ghantali Prasad, Naupada, Thane (W). Mumbai - 400601. We are currently not accepting new members in the Lean Queen program. New membership slots open once every few months (this is because we need to personally support each member). NOTE: If you came here from a notification list page, and are just looking for more information, ignore this and continue reading. 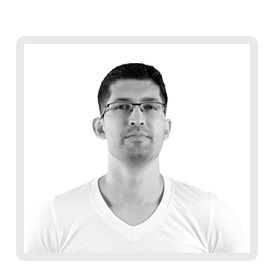 Scientific Nutrition is India's first research backed, fitness and health startup based in Mumbai. 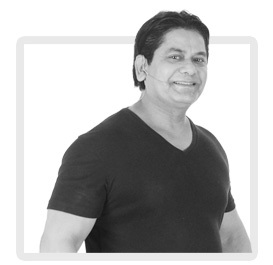 Our mission is to help our fellow Indians get fit, healthy and eradicate the term "lifestyle disease" from their life! Our team consists of nutritionists and trainers who have a combined experience of over 50 years! 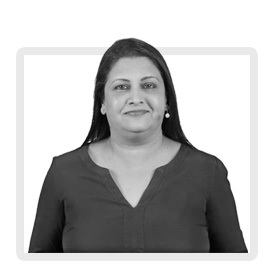 Veteran in the fitness scene, Shubha Ma'am has trained various kinds of women, from housewives to youngsters and even Miss India contestants! A Precision Nutrition® coach, and a Crossfit® L1 trainer, he is also our founder. Obsessed with nutrition, he's always coming up new ways of ingesting protein! 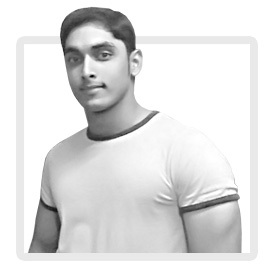 Hussain is our master trainer, he oversees all the movement and weight training sessions. A natural bodybuilder who loves the use of compound movements.